This is a series of adult Sunday school lessons compiled and taught by Pastor Dan Gordon at Home Missionary Baptist Church. The BIBLE is the world's greatest, most miraculous, most amazing and most glorious book! Among all the books ever written, the BIBLE stands unique! Today so-called Christianity abounds with superficiality. It is so far removed from what is described in the Bible because of indifference toward the Bible! The spiritual health of a child of God is connected with what they do with the Bible! 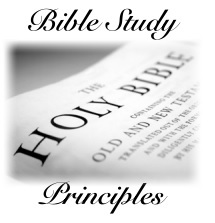 Presented side-by-side are the written LESSONS on "BIBLE Study Principles" and the recordings of these lessons as taught by Pastor Gordon during our Sunday school service.